KSCB/KLDG’s microphones will be spread out this weekend. Friday will be especially exciting with three local sporting events at one time. 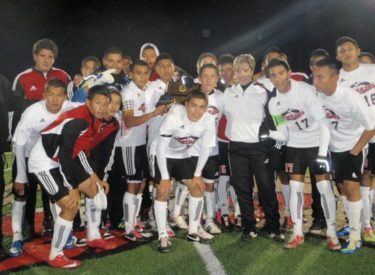 The Redskin soccer team plays in the "final 4" at Kansas City Piper High School Friday night and Saturday afternoon. The 14-5 Skins play 14-3-2 Topeka Seaman at 7 p.m. on B107.5. Daniel Zuniga and D.J. Zuniga will provide the play-by-play Friday night and Saturday. If the Skins win, they play in the championship at 2 p.m. with the third place game at noon Saturday. It’s rivalry time in Beaver County Friday night. The Beaver Dusters host the Turpin Cardinals for the final Game of the Week of the season. Jack Jacob and Joe Denoyer will describe that game at 7:30 on 102.7. The Seward County Saints open the basketball season Friday and Saturday nights with the Pepsi Classic. Brock Kappelmann will provide the play-by-play Friday as the 1-0 Lady Saints play Southwestern Christian at 6 p.m. with coverage beginning at 5:45. The Saints play the Sterling JV at 8 p.m. Saturday, the Lady Saints play Air Force Prep at 6 p.m. with coverage at 5:45 and the Saints play God’s Academy Prep School at 8 p.m. on Talkradio 1270 and kscbnews.net.